1. Michael Jordan: In the Top 10 List of basket ball players of all time we should put the name of Michael Jordan in the 1st position. His full name is Michael Jeffery Jordan and nick name is Air Jordan. He was born on 17 February 1963. He was playing for Chicago Bulls and Washington Wizard. His total NBA points are 32392. He started his career with Chicago Bulls in 1984. He is the best basketball player of all time. He also awarded the athlete of the century. His dribbling skill is mind blowing. 2. Kareem Abdul Jabbar: In the Top 10 List of basket ball players we should keep the name of Kareem Abdul Jabbar in the 2nd position. He was born on 2nd April in 1947. His height is 7’2”. His total NBA points are 38387.he was playing for Milwaukee and Los Angeles Lakers. He is famous for his sky hook. He won 6 MPV award. He is the height point’s winner of all time. 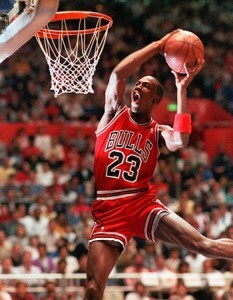 He is the basket ball legend of all time. 3. Karl Malone: In the Top 10 List of basketball players we should keep the name of Karl Malone in the 3rd position. He was born on 24 July 1964.like Jabbar he is also great in NBA. He played for Utah Jazz and also for Los Angeles Lakers. He gained total 36928 points. He owned the MVP award for two times. He is also the legendary players of NBA. 4. Wilt Chamberlain: In the Top 10 List of all time great basketball players we should keep the name of Wilt Chamberlain in the 4th position. He was born on21 August in the year 1936. His height is 7’1”. His total NBA points are 31419. He was playing for Philadelphia Warriors and for Los Angels Lakers. He won the MVP for two times. He is also a great NBA player of all time. He was the Rookie player of the year 1960. 5. Oscar Robertson: In the Top 10 List of basketball player of all time we keep the name of famous basket ball player Oscar Robertson in the 5th position. He is also a great player. He was born on 24 November in 1938. He played for Cincinnati Royals and also for Milwaukee Bucks His total NBA points are 26710. He is also the MVP winner basket ball player. His 5th height point makes him one of the great basketball players. 7. Bill Russell: In the Top 10 List of basket player of all time we keep Bill Russel in the 7th position. He is great player. He is known as the best defender of all time. He was born on 12 February 1934. His total points are 14522 in NBA. His height was 6’4”. He won the MVP for 5 times. He is the NBA champion for 11 times. He is a legendary player. He was played for Boston Celtics. 8. Moses Malone: In the Top 10 List of all time famous basketball players we should keep Moses Melone in the 8th position. He is a great player of basketball. He was born on 23 March in 1955. In his 22 years career he won many achievement. He gained total 27409 points in NBA. He has won the MPV in three times in the year 1975, 1978 and in1989. He was the NBA champion in 1983. His height is 6’10”. He was the player of Houston Rockets. 10. Jerry West: In the Top 10 List of all time famous basketball players we found Jerry West in the 10 position. He is one of the big gun of basketball. He was born in 1938 on 28 July. His height is 6’2”. He was s the NBA champion of 1972. He played for Los Angels Lakers. His total NBA points are 25192. He also won the MVP award.